Resistance Brownies — Simple. Whole. Paleo. 1. Preheat oven to 350 degrees F. Grease and dust with cocoa powder a 9x9 square baking dish (or use the baking spray with flour in it). Alternatively, you can line the dish with parchment paper. 2. Whisk together the butter, sugar, and vanilla. Add the eggs one at a time, mixing well between each egg. Use a handheld mixer if you have one. 3. In a separate bowl, whisk together the flour, cocoa powder, baking soda and salt. Sprinkle some of the dry mixture to the chocolate chips, so they get a light coating. 4. Add the dry ingredients to the wet ingredients in 3 batches, and mix with a wooden spoon or spatula. 6. Spread the batter (it will be thick!) into the prepared dish and spread evenly. 7. Sprinkle the top of the batter with a few pinches of salt. 8. 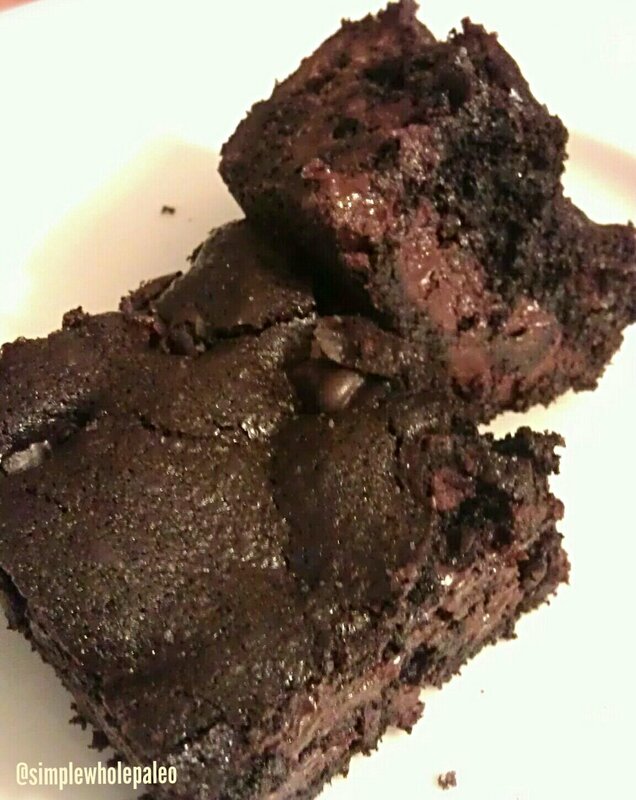 Bake for 20-25 minutes until the brownie pulls away from the sides of the dish. 9. Cool in pan for 10-15 minutes, then tip onto a wire rack to cool completely. 10. When completely cool, cut into 9 or 16 squares. I like to use a serrated knife, and clean it in between each cut.